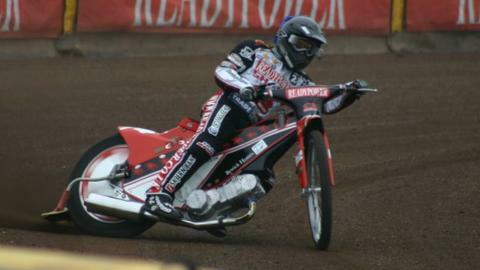 Peterborough Panthers have quit British speedway and been put up for sale by owners Rick Frost and Julie Mahoney. Leicester Lions will replace the Panthers in the Elite League. The Cambridgeshire club, who won Elite League titles in 1999 and 2006, will be allowed to return to a lower division, should they successfully find a buyer. "This was a very difficult decision to make, having put our heart and soul into Peterborough Speedway for over five years," said Mahoney. "We faced several problems, primarily the conclusion of the five years of the Readypower sponsorship, and without another team sponsor coming in or a firm TV deal, we couldn't commit ourselves to another year not knowing where we would stand financially. "Without a confirmed TV contract we had nothing to offer to a team sponsor at the level we would need one to come in at. "I'm very sad about it - everyone knows at times we've become disillusioned along the way, but this isn't the time to go into that. "We've put a heck of a lot of time and effort, not to mention money, into it and I don't know where we could take it now - it's sad and unfortunate that we've got to this point but there has to come a time where you have to say enough." Leicester's admission to the Elite League was approved at the weekend's British Speedway Promoters' Association Annual General Meeting, putting the Lions into the top-flight for the first time since the club was reformed in 2011. "We are delighted that our application was accepted and would like to thank the Elite League for welcoming Leicester into the fold," said co-promoter Alan Jones. Elite League: Belle Vue, Birmingham, Coventry, Eastbourne, King's Lynn, Lakeside, Leicester, Poole, Swindon, Wolverhampton. Premier League: Berwick, Edinburgh, Glasgow, Ipswich, Newcastle, Plymouth, Redcar, Rye House, Scunthorpe, Sheffield, Somerset, Workington. "It is an exciting new phase in the evolvement of the club and work now starts here to build a competitive team for 2014." The AGM also addressed concerns that BSkyB may not continue their television rights deal with the sport next year. The broadcaster's fee is crucial to the financial stability of British speedway. BSPA chairman Alex Harkess said: "Our ongoing discussions are proving very positive and I am confident we will bring this to a satisfactory conclusion. "I am looking forward to sharing an announcement with our partners in due course." It was also decided that as of next season Elite League sides will operate with a 32-point limit on their top-five riders, while the final two places in a side must be occupied by National League riders.